A wet room is basically a specialized bathroom that is completely open, including the shower area, toilet area and changing area, and is especially practical for those with disabilities. practicality for those with disabilities. home construction or to an older home that is being renovated. bathroom to conform to wetroom specifications. How to Install a Wet Room: DYI or Building Contractor? Unless you are a skilled handyman or DIY'er, you will probably need to the services of a competent building contractor for installation. A building contractor can help guide the entire process which will also require a plumbing contractor and electrician. One of the best reasons for using this particular bathroom design in any home, whether or not there is a handicapped family member, is the dual function that it offers. The fact that these designs are open floor plans make them a favorite for easy wheelchair maneuverability, or for those who are a bit more mobile as well as for those with no disabilities. There are no shower curbs or enclosed spaces anywhere in the room, which can often be hazardous for many disabled users. Doorless, curbless wet room shower areas are easy to enter and leave, as well as providing very accessible wall mounted toilets and vanity sinks. It's easy to install the necessary number of grab bars along the wall areas as well, making it extremely safe. Even if you decide to use many of the ADA bathroom requirements in building your new room, it can still have lots of appeal for everyone. This particular design is a great choice for renovating a small bathroom that already exists in a house, since there isn't much space to work with when creating a handicap accessible bathroom. By simply gutting the existing bathroom and "tanking" it for proper water resistant sealing, you can enjoy a completely open shower, toilet and vanity space for easy movement. Note: If you're planning on renovating an existing bathroom for wheelchair accessibility, you will generally have to widen the entrance door for easy access. 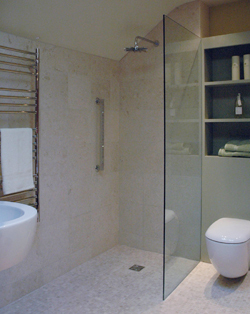 Otherwise, the wetroom design is great for complete wheelchair use. Today's homes are often planned with the future in mind. The boring, institutional look of the past are no longer part of a modern, more trendy bath room plan. An open space, beautiful tile, sleek, wall mounted fixtures and lots of natural or warm, interior lights can make for a very attractive, comfortable room that is highly enjoyable for all. This design also adds value to homes since many people are looking for a house that they can grow old in or in which they can bring an aging parent who is struggling with limited mobility. This all-inclusive design makes it a favorite for everyone in the house and a very valuable asset. Even though the initial expense can be a bit more than building or retro-fitting a conventional bathroom for the disabled, it is relatively easy to design the placement of the fixtures. Since there is no framing-in for areas like handicap shower stalls or conventional handicap bathtubs, you can forego with these expenses. Most of the expense is put into proper drainage, tanking the wet room and adding the proper tiling to the floor and walls. not shift or flex. You can also use a one-piece wet room shower tray that is customized with the necessary sloping for drainage. The tile is then laid on top of either material. Tanking is the method that is used to create a water-tight membrane over the subfloor and wall areas before the tile is installed. The floor and walls should be covered with exterior grade, water-resistent plywood. Then, a thin gel is applied to the walls and floor where the tile is to be attached. This creates a completely waterproof membrane around the floor and wall space. There are tank kits for wet rooms available for correct installation. It is recommended that ceramic tile is the best disabled bathroom flooring that should be installed for wet rooms, since it is non-porous and will not require constant upkeep and sealing. Other types of tile such as marble or slate have to be sealed about 4 times a year in order to keep moisture from seeping into the porous material. Ceramic tile is generally moderately priced in comparison and is also much more durable. A well-built, quality bath space will actually last longer than a conventional handicap bathroom design or residential space in general. It requires less up-keep, plus there is less that can go wrong in the functioning of these bathrooms, if they are installed properly. DIY'er, if the proper planning and design elements are applied.